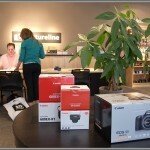 In a lucky bit of timing I happened to be dropping off a camera at Pictureline when their first Fujifilm X-Pro1 digital rangefinder was delivered. 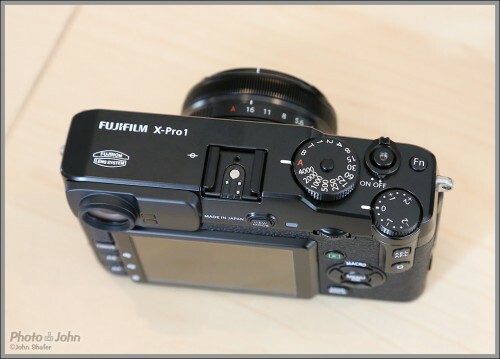 The X-Pro1 is one of the most interesting cameras to come out this year (Fujifilm X-Pro1 intro article) and this was the first time I’d seen one in person. So I made arrangements to return in the afternoon and make a hands-on first impressions video. You’ll find that video below, along with my own thoughts on the camera after playing with it a bit. I was also able to shoot a few informal sample photos in the store, including a full set on a tripod at all ISO settings. I’ve included those photos in the article, along with my initial impressions of the X-Pro1’s image quality (it’s very good). 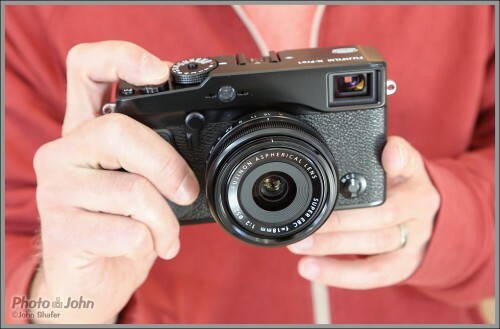 The first thing we all noticed about the Fujifilm X-Pro1 is how light it is – especially if you’re used to a digital SLR or you’ve ever handled a Leica rangefinder. We were surprised since it isn’t really a small camera and the body is all metal (magnesium). This is one of those areas where the spec sheet just doesn’t tell the whole story. However, in spite of the light body, the X-Pro1 fights in a heavier weight class. It’s got pretty much all the functionality of a digital SLR along with some Star Wars features that not even digital SLRs have. One of the standout high-tech features is the hybrid viewfinder, which toggles between pure optical with a cool electronic overlay; and pure electronic (EVF), with all the information you’d normally see on the LCD display. The X-Pro1 also features a brand new exclusive 16-megapixel X-Trans sensor that I think is the most important part of the camera. Instead of the traditional red / green / blue pixel array that other digital cameras use, Fujifilm has arranged the sensor in 6×6 pixel grids with the red, green and blue pixel positions randomized. That is supposed to eliminate moiré patterns and allows Fujifilm to not use an anti-aliasing filter over the sensor, increasing the amount of light that reaches the sensor and improving image sharpness. 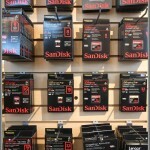 Another thing we all liked about the X-Pro1 was the simple, intuitive controls. Just like a traditional manual focus film camera, aperture control is via the aperture ring on the lens and shutter speed is controlled by a dial on top of the camera. There’s also a nicely placed exposure compensation dial on the top plate, right next to the shutter speed dial. Manual shooters should love the X-Pro1 exposure controls – especially those who started taking pictures back in the olden days, before auto everything. 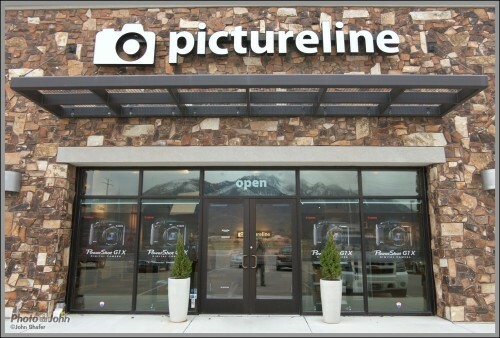 Pictureline only had two lenses for the X-Pro1, the 18mm f/2.0 and the 60mm f/2.4. The 1.5x crop factor from the APS-C sensor effectively converts the focal length of those lenses to 27mm and 90mm, respectively. I would have preferred the 35mm f/1.4, which shoots like a 50mm lens, for testing. But beggars can’t be choosers. After a bit of fumbling with the aperture ring and shutter speed dials (it’s been a long time since I used a camera with an aperture ring), I took a few test shots in the store. I found I actually preferred the EVF to the optical viewfinder, which surprised me. Electronic viewfinders have come a long way in the past few years and the X-Pro1’s EVF is bright and clear and has all the data I’d normally have to check the LCD for. 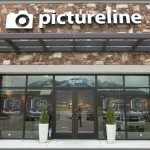 I shot a couple pictures of the Pictureline storefront at ISO 200 and a set of tests shot on a tripod at all ISO settings. Then I cranked the sensitivity up to ISO 800 and 1600 and walked around the store taking pictures. I was really impressed with the results at what I thought were high ISO settings. The photos look totally clean at ISO 800 and ISO 1600 looks great, too. Looking at the informal test photos I shot of the Pictureline filter display (full set of Fujfilm X-Pro1 informal test photos on next page) , I think the camera is excellent even at ISO 6400 and useable at ISO 12,800. Of course, “useable,” is subjective. 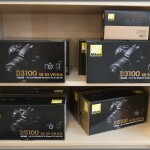 But I’d be really happy to use the X-Pro1 at ISO 12,800 for tradeshow, street, sports or low light event photos. And I think you could do landscape and travel photography without a tripod at ISO 800 and get super clean, detailed images with the X-Pro1. However, it’s still an APS-C sensor and the image quality doesn’t compare to the new Nikon D800 or Canon EOS 5D Mark III. It’s the best I’ve seen so far from an APS-C sensor camera, though. Because it has auto focus, using the X-Pro1 is very different from using a traditional rangefinder camera like the Leica M-series cameras. 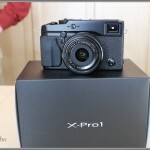 I really enjoy the Leica M9 but found the X-Pro1 much more intuitive and comfortable to pick up and start shooting with. The electronic viewfinder (EVF) also offers the possibility of zoom lenses, something else that I rely on and that isn’t possible with a traditional rangefinder camera. Between the auto focus, the EVF, the light weight, the potential for zoom lenses and the price (compared to the Leica M9 and mid-range DSLRs), I could see owning an X-Pro1 – especially as a travel and event camera. And for anyone who’s been lusting after a Leica M9 but just can’t swallow the price (about $8500 for an M9 and lens vs. about $2300 for an X-Pro1 and lens), the X-Pro1 is an excellent alternative. In fact, for most photographers I’d say it’s the better camera. As much as I love the feel, optics and tradition of the M9, it’s just not a practical camera choice for me or most other photographers. The X-Pro1, on the other hand, offers a really nice balance of traditional rangefinder shooting and contemporary digital SLR features and performance. And with the right adapter, you can even use Leica M-mount lenses on it! 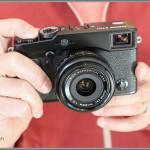 Thanks to Pictureline for providing the Fujifilm X-Pro1 for this article and video! Actually, I think they say the top and bottom plates are magnesium alloy. The only thing they say about the body itself, is that it’s covered with a “leather like” covering. They never said what material the body is constructed of. The other reviews mentioned the very slow focus and that it is extremely overpriced. As for a comparison to a Leica, there is only one camera that “is like” a Leica, and that is of course, another Leica! I do have a Question: So did you buy one PhotoJohn? Good details about the build, Joe. Regardless, the X-Pro is crazy light for its size. I did not notice slow focus, although I only got to use it for about half an hour. Overpriced – I don’t know about that. Compared to an M9 it’s really cheap. But compared to the Olympus E-P3 it’s definitely expensive. The image quality is very impressive, though – the best I’ve seen from an APS-C camera. So you are getting something for your money. I did not buy one. I mostly use zoom lenses so a camera that limits me to primes isn’t going to cut it. 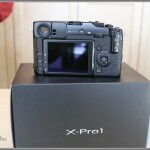 If they do come out with some zooms for the X-Pro1, I will get more interested. 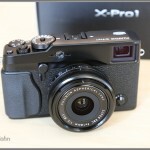 I really enjoyed using the X10 and the X-Pro1 feels very similar. With zoom lenses, I think it could make a very good travel camera for me. Hey Photo-John, I gotta tell ya right off, I have quite a list of “should haves” for Fuji. But I’m not saying any of that here. 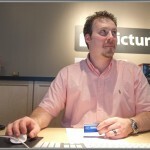 I have too much respect for you, your site, Nick & “PIictureline” . Let’s look at the glass half full today O K? So, you used the Fuji a bit & you liked it John. I could see that, who wouldn’t want a chance to check it out? Kinda brought you back to a much different photo world,(Modern Photography before the merger) when we got our “Photo by____” credit & stock photos where supposed to be our nest-egg. A Very extreme Disappointment! Sure it was quieter, there were much fewer of us around then. mind shooting with that one for an hour or two either. To any of you, who read the prior posts, please take a moment to read this. It has to do with Rangefinder cameras and the less used Twin Lens Reflex camera. There are a few reasons that these cameras became practically extinct. First thing you need to know is the Parallax Factor. You need to remember in either case that you’re looking through one lens, and your photograph is being taken from the other lens. On the Rangefinder, the other lens is the eye viewfinder, but it still is a type of lens. When you’re a distance from your subject, the Parallax Correction (and the distance) pretty much do the job for you, but when you come in close to the subject it’s a different story. You may not get any part of your subject in the picture because you are looking in the viewfinder (lens) and the camera lens may be way off the mark. The same is true for the TLR or Twin Lens Reflex camera, even more so. Another problem that came with the TLR and Rangefinder was the flash sync. You had to adapt to the sync speed if the shutter was in the lens, or if it was a Focal Plane shutter. It was pre set, you had to adapt. Depending on what you were shooting, you had to work with that sync speed. A third problem has to do with accessories. Putting on a filter on a TLR might mean finding a 36MM filter. Putting a filter on a rangefinder involved getting coloured filter plastic sheets, scissors and tape. If you’re asking yourself “Why bother?” Well, there are some advantages. It’s a quieter shutter, a Rangefinder is usually smaller, it seems to do very good street photography. Some people prefer them, the easy going people. They don’t worry about getting everything exact the way most of us do. I have an X-Pro1 on my list because I ***DO*** remember D76, and Panatomic-X and still probably have measurable levels of Dektol in my venous system. I also own a 35mm f1.4 Summilux, a 50mm f2 Summicron, and a 90mm f2.8 Tele-Elmarit – and, you guessed it, a 1982 era Leica M4P that rarely gets used vs. my D7000 and D300. I would love to be able to justify an M9, but can’t. I’m just waiting for the Fuji M adapter to be available. I still crave the absolute focus certainty of a manually focused or guess-focused rangefinder. At the risk of being called a troglodyte, I believe that if you can’t look at a scene and figure out exposure by eye for 200-800 ISO within an f stop or so, you aren’t yet a photographer. I am amazed at how many of today’s camera users never turn off autofocus and autoexposure, and just take the time to learn the basics. 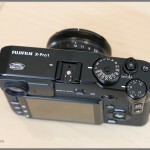 I understand that the Fuji lens are basically focus-by-wire, not mechanical in manual mode, which is discouraging. PS: I still have a Mamiyaflex C-3 with the 180mm lens(es) (and the awful Porroflex mirror prism) and a Minolta Autocord CDS. Like you, I made a ton of money in college and afterward with both. My son has my 645 system (the old one with the drop-in film spools). Another money-maker from the 80s! Why are you NOT using your Leica? What are you saving it for? Because you don’t want to use film? And also, You would attach a LEICA lens to another parties (a 3rd party) Adapter? I’ve seen lenses stuck on adapters, bodies, extension tubes, you name it. It almost never turns out right. You might save one piece, but it’s very hard to save Both!. Sometimes the pieces are locked in to each other. You know people are still using film, you might like it better now. 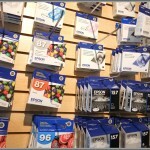 You can scan them to digital if you want to, or you can have it done almost anywhere. I do. Only attach different brand gear to each other if it’s been approved by both manufacturers. Only attach unapproved gear if you’re willing to lose one or both pieces of gear.